Two-player campaign mode co-op? Please, that's so Gears 2. According to an update from designer Cliff Bleszinski, the recently revealed Gears of War 3 will feature twice the multiplayer co-op campaign mode of its predecessors. Marcus and Dom are going to have to keep their feelings in check during the Gears 3 campaign, as two more players will be able to join in their desperate quest to put the storyline to bed. The game will let up to four players work their way through the game's narrative, and each player is integrated into the story, meaning you won't have to worry about being nameless guy number two, tagging along with the greats like an over-muscled puppy. Plus, one of your friends has to play the girl. Also, Rod confirmed and I'm posting it here: 4 player integrated story co-op in the campaign! Great! I'm all for the idea. The more the merrier, that's what I always say. 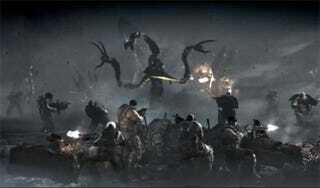 If only I didn't have an odd aversion to the Gears of War series as a whole, this would definitely get me excited. It's not that I think the games are bad; they're just not for me. I'm sure there are others out there who feel the same. Perhaps they are hiding in caves. Thanks DrDurdon for the tip!